Last week we covered circuit breakers and their role in the safe delivery of the electrical power to our homes and businesses. It should be mentioned that synonymous with breakers is the word fuse. Depending on the age or type of circuitry within your home or business you could be dealing with a fuse box instead of a breaker box. And while the individual fuses within also protect against over current conditions, they are a one-time use device and once activated, they must be replaced. Whether you have fuses or breakers, they are only designed to protect the downstream wiring from overheating. What I would really like to cover today is the part of the electrical supply system that is designed to protect us from harm and that is the Ground Fault Circuit Interrupter, or the GFCI. But first, just what is a ground fault? Ground faults are the unintended electrical pathways between a power source and a grounded surface. They often occur when equipment is damaged or defective. When electrical parts are no longer adequately protected from unintentional contact and your body provides a path to the ground for this current, then you could be burned, severely shocked or electrocuted. What is, and how does a GFCI protect me? The GFCI is a generally inexpensive device used to detect small differences in the flow of current through a circuit. They are intended to be installed or used when electrically powered equipment is operated near water or other wet or damp locations. Without getting too technical, it will immediately disconnect from the power source if it senses a current flow of about 6 milliamps (.006 amps) from the incoming source to a grounded neutral system. Humans can sometimes detect a mild tingle at about 1 milliamp (.001 amps), but the GFCI reacts so quickly in most situations that we probably wouldn’t feel even that. For reference, 10-20 milliamps (.1-.2 amps) are all that are required to cause the heart to quiver rather than fully squeeze allowing blood to flow. There are three main types of GFCI devices that we encounter routinely. One is the receptacle type most of us have probably seen. These typically have the test and reset button in the middle of the faceplate. These can be wired as a standalone or it may be a “pass-through” where it protects other electrically connected devices downstream. The second is a GFCI protected circuit breaker. This device installs in the breaker panel and protects all of the wiring connected to it from over current, just like a regular circuit breaker does, plus shock and electrocution protection to us mortals. 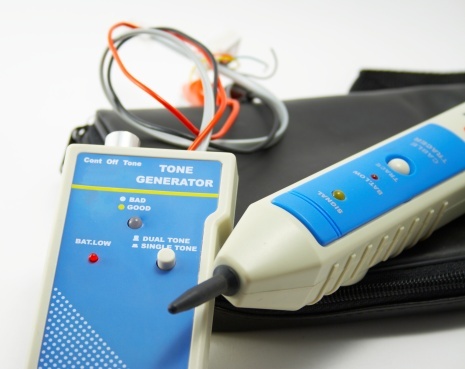 The third GFCI that we should be familiar with is the portable type. This has the GFCI circuitry in a plastic enclosure with a male and female end much like a very short extension cord. They can also be a built-in part of a much longer extension cord which provides some extra flexibility in overall function. It’s important to note that for a GFCI to function as designed, it must be installed or used correctly. I won’t go into the installation details here, but they are a relatively easy device for most homeowners or maintenance personnel to put in, though the installation instructions must be adhered to. If you are unsure about the process yourself, then contact a qualified individual or licensed electrician to do that for you. Using them is a simple as plugging into the device or a circuit that is protected by one. The current National Electrical Code (NEC) requires them to be used in the following areas. Portable GFCI devices should be utilized whenever electrically-powered gardening equipment or electric power tools in and around the house are being operated as well. To ensure that they function as designed they must be tested. This testing should occur immediately after installation and at least once monthly, or according to the manufacturer’s instructions. There are inexpensive plug in testers that can be purchased, but make sure that you read and understand the directions for using them. Don’t ignore a failed GFCI test. Determine the cause or replace the device to see if the issue continues. You should always investigate those GFCI’s and the protected circuits that do trip during use as well. An example: If a GFCI trips when plugging something into the circuit, be especially wary of that device. Unplug it and inspect it for visible signs of damage or exposed wiring. If none are found, then reset the GFCI and plug the device back into the circuit, if the GFCI trips again then do not attempt to use the tool again until it has been inspected by a qualified individual. Under no circumstance should you plug it into an unprotected receptacle without having it inspected first. While GFCI’s do occasionally wear out, becoming more sensitive overtime and may become damaged by some sort of power spike, if it has tripped and will not reset, you should consider it more likely to have an actually current leakage issue rather than a bad GFCI. You can try and unplug or turn off all devices that the GFCI is connected to and see if it resets then. If it does, then one of those has an issue and must be identified. You can try plugging in or turning on those to see when the GFCI trips again, or you may need to contact an electrician to investigate the cause. At the end of the day, the invention of GFCI has significantly decreased the injuries and death that occurred prior to its widespread use. We owe it to ourselves to have a basic understanding of how it works and why it is needed and I hope that you are better informed having read through this message. As always, feel free to reach out to me if you ever have any questions or concerns about any safety issue.